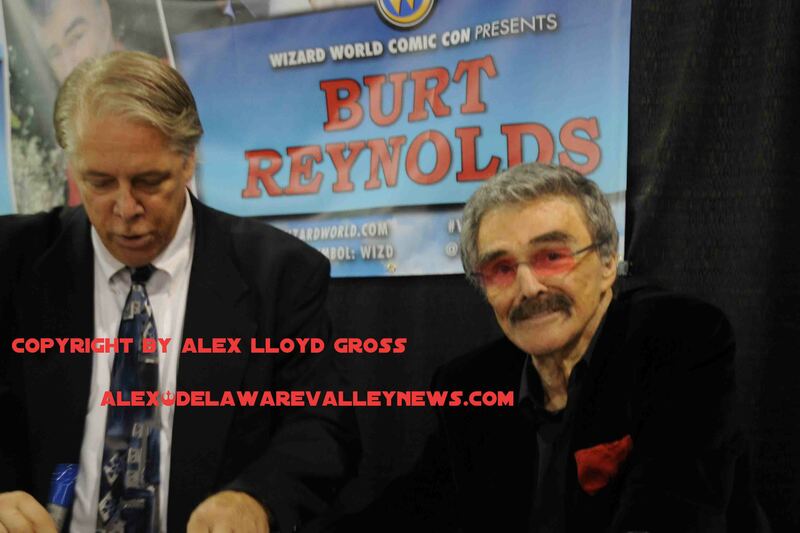 Alex Lloyd Gross- Photo- Delaware valley News.com Burt Reynolds in May 2015 in Philadelphia at Wizard World. Burt Reynolds died today, September 6, 2018. He was 82 years young and he was a legend. He was besieged with autograph requests even in the waning days of his career. It was announced that in May 2015he would come to Philadelphia to meet his fan sat the Wizard World convention. His booth was non stop. Yes he was charging for autographs and selfies, but he was nice and kind to his fans. He would be asked about Smokey and the bandit, or Boogie Nights. He took all of the questions in stride. At conventions some agents get overcome with greed, not allowing fans to take photos of their favorite actor unless money is exchanged. With Reynolds, it was a hands off policy in Philadelphia. Anything goes, he realized his fans wanted a keepsake and he was going to give it to them. Members of the press were permitted limited access to his table. Most of the paparazzi wanted to get photos of him walking with a cane, appearing frail. That was fine as well. He was there to meet his fans. He drew most of the press that year in spite of the fact that Billie Piper was there, Danny Trejo and others as well but it was Reynolds who commanded most of the headlines and all of them were positive. Conventions such as Wizard World exist to facilitate fans meeting their favorite actors. Reynolds charged a guarantee which was paid. This was his only area appearance for the convention circuit. As his career slowed down, he appeared as Congressman David Dilbeck in Spriptease and Jack Horner in Boogie Nights. Both films won him critical acclaim.